OK folks, I’m getting back on track here. Having a laptop that works properly makes all the difference. This is Brand New (but does not, thank goodness, involve touch screen – the charming young man in the shop agreed that would be a step too far, given my limited technical abilities). But I can save things, and write things, and look at things, which is all I want to do really, and I am sure it will prove most satisfactory when it comes to ordering books – except, of course, I keep promising there will be No More Books, so forget I mentioned it! 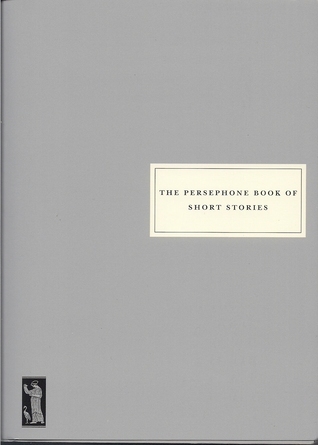 Anyway, it’s Sunday, and it must be time for a Short Story so, since I am catching up, here is a selection of short stories from my trusty copy of The Persephone Book of Short Stories. 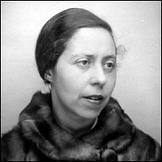 This week I have two: Dimanche, by Irène Némirovsky, and The Photograph, by Phyllis Bentley. I daresay most of you know that Némirovsky escaped the Russian Revolution and fled to Paris, only to die in Auschwitz, leaving behind a body of work which included the unfinished Suite Française (which is sitting on my TBR stack). I must admit, I didn’t realise that in addition to her novels she wrote short stories, but apparently she produced more than 40 of them, including this one, which focuses on a mother and daughter who, on the surface, appear very different (they certainly think so). But when it comes to love Agnès and 2o-year-old Nadine are not so dissimilar after all, for both are victims of men who do not care – or do not care enough. Over the years Agnès has become resigned to the point of indifference, and no longer waits in despair for her charming but errant husband to return from his latest affair. Seemingly calm, serene, and self-contained, she finds pleasure in the quiet beauty of everyday life. But as she contemplates the past, and remembers her hopes and fears, Nadine is playing out the same kind of scene, suffering as she waits for a man who doesn’t turn up. Némirovsky has a light touch when it comes to writing about feelings and emotions, and her descriptions of Paris at lunchtime on a hot spring day conjure up the sights, sounds and smells of the city. Things may have changed since this was written in 1934 – for example, Parisians no longer head for the country on Sundays, they head for the banks of the Seine to take some exercise). But the smell of fresh baked bread still wafts through the air; above the noise of the traffic you can still hear church bells and birds, and the chestnuts still flower in the Luxembourg Gardens. I liked the way Dimanche is written, and its quiet restraint with all that hidden emotion seething away beneath the two women’s placid exteriors. an ageing, down-on-her-luck, out-of-work governess who considers trying to pass herself off as a younger woman in a bid to secure a job in the south of France. She is admirably suited for the role, but feels her age may be against her. Well! 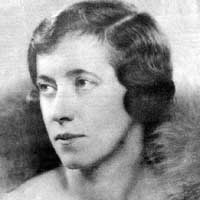 She would say she was twenty-nine, and she would have a new, modern, young, almost coquettish – Miss Timperley smiled and bridled at the word – photograph taken. She could not afford it of course; but it had to be done. She put on her clothes with quite a rakish air, and betook herself to an expensive West End photographer. They’re as like as life. Just your pleasant look, they have. They’re right down good. Poor Miss Timperley (who reminds me a lot of Miss Pettigrew), sends the picture off with her letter of application for, at the end of the day, she cannot tell a lie, and cannot obtain a post be deception. She decides it is better to starve than to cheat, and that she will go down with her flag flying. She even informs her prospective employers of her real age – 58. Then she weeps, ‘pressing her thin fingers against her anguished face’. A week later there is a response from France. Really, I shouldn’t reveal the ending, and I shouldn’t tell you whether the new photo worked its magic, but you all know how much I love a happy ending, and I loved this little tale, so draw your own conclusions! This was a lovely story, full of humour and warmth, that left me wanting to know more about Miss Timperley, and more about Bentley’s work. I have here a copy of The Persephone Book of Short Stories which I’ve been reading very slowly and haven’t yet finished, but now I’ve moved my Mother into her new home – a snug and comfy little ‘sheltered’ flat, close to the town centre, so she can get out and about again and be a bit more independent – life should settle down again, and I’ll have more time for reading. So, as part of my catch-up plan (I know, I keep saying I’m going to establish a regular reading/writing routine, and I haven’t succeeded yet, but I live in hope) I’ve pinched an idea from Danielle at A Work in Progress (I hope she doesn’t mind) and I’m aiming to post a weekly Short Story Sunday piece. 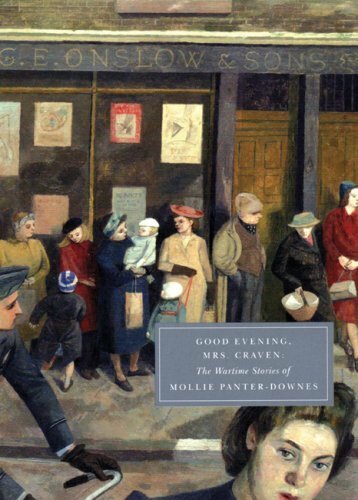 It’s a genre I’ve never really explored, until last year, when I had the pleasure of discovering short stories by Dorothy Whipple, Mollie Panter-Downes, Mary Norton and Alice Munro. Before that I think the only other collections I came across were the Penguin Books of Short Stories, Volumes 1 and 2, which I read when I was at school or college, so many years ago I can’t remember which. And, as you can tell from that, they obviously didn’t make any impression on me at all! Oh, and I nearly forgot, I also read ‘A World of Difference: An Anthology of Short Stories from Five Continents’, as part of an Open University course I studied for a couple of years ago, before I ran out of cash, and I thought some of them were very odd indeed. Anyway, I’ve just had a birthday, and consequently decided that over the next year I’ll try to try do at least one new, enjoyable thing each week, and I think being more adventurous with reading definitely falls into that category. 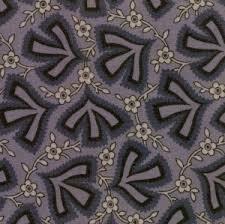 So, back to ‘The Persephone Book of Short Stories’, which was the 100thbook published and features two different endpapers – one, at the beginning, has a design with flowers and things that look like arrows but might be plant stems and leaves, all in shades of brown, taken from a roller-printed cotton twill weave manufactured in 1911 at the Arnold Press Print Works in North Adams, Massachussetts. It’s not at all the kind of thing I like – I think it looks very sombre and faintly sinister. However, the design on the inside of the back cover is fantastic. 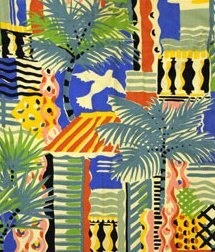 It’s a picture of a lovely screen-printed furnishing fabric, obviously based on a Mediterranean scene, with sun and sea and balconies and canopies and shutters and birds, all in vibrant colours and patterns. It was designed in 1983 by Susan Collier and Sarah Campbell for Fischbaker Ltd. You could argue that none of that really matters, because the appearance of a book has no bearing on the contents and you would, of course, be quite right – but nevertheless, I have to disagree. Most of my books are cheap, tatty, old paperbacks, but I really enjoy beautiful books – they are things of joy, to be loved and treasured, and personally I feel they add immeasurably to the reading experience, offering food for the soul as well as the mind. Anyway, I digress (again). The book contains 30 stories by 27 female authors, some of whom I have read and loved in the past. 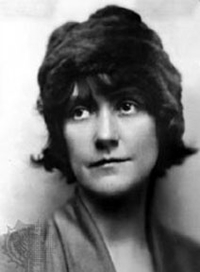 Others have produced work I failed to engage with, while a few are completely new to me, including Susan Glaspell, who wrote From A to Z, the first piece in the collection. Written in 1909, it tells of Miss Edna Willard, who has just finished her senior year at university and dreams of a job in publishing. Her conception of her publishing house was finished about the same time as her day-class gown. She was to have a roll-top desk – probably of mahogany – and a big chair which whirled round like that in the office of the undergraduate dean. She was to have a little office all by herself, opening on to a bigger office – the little one marked ‘Private’. There were to be beautiful rugs – the general effect not unlike the University Club – books and pictures and cultivated gentlemen who spoke often of Greek tragedies and the Renaissance. She was a little uncertain as to her duties, but had a general idea about getting down between nine and ten, reading the morning paper, cutting the latest magazine, and then ‘writing something’. The reality, of course, is very different (but, generally speaking, I find it always is). 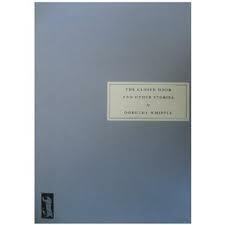 She obtains a position in a publishing house in Chicago, on run-down Dearborn Street. The company rents a penned-off space in a bleak, dirty building – the other side of the partition, which only extends part-way up the room, is a patent medicine company dealing with Dr Bunting’s Famous Kidney and Bladder Cure. It’s not only the location and surroundings which are all wrong, but the work itself, for she and her colleagues are engaged in the making of a dictionary, which involves poring through old dictionaries and modernising and expanding the definitions, whilst ensuring the copyright of the originals is not breached. It’s not what she hoped for, but she works diligently and gradually falls in love with the older man at the next desk, who is ill and down on his luck, and has ‘the voice the prince used to have in long-ago dreams’. As they work on the dictionary they pen little notes to each other, based on definitions, which is all rather sweet and charming, but you know the burgeoning relationship is doomed, that dreams are dangerous things, and fairy tale princes do not exist in the real world. Edna’s new-found friend realises he is on a crash-course to destruction, but cannot – or will not – grasp at the chance of redemption. For him, as the song says, happiness is just an illusion. But he refuses to drag Edna down with him, and when they reach the end of the alphabet he bids her farewell. Distraught, she wanders the streets in the pouring rain, searching for him, but fate intervenes in the shape of Harold, the boy she liked most at university, who ‘rescues’ her and takes her home, whether she will or not. It’s a deceptively simple tale of lost love which stayed in my mind after I read it. I liked the way Glaspell built her characters, and her description of the cityscape, and the understated tone of the piece, and I found myself wondering about the people. What happened to Mr Clifford (the man at the next desk) to make him so bitter and disillusioned with life, and was he right to reject the chance of happiness? And if he had taken that chance, would he have continued on his downward trajectory, and would Edna have become equally dissatisfied as her dreams were shattered? And what about Harold, a bit part player, who appears on the scene by accident – how come he was in that place, at that time? And is he the hero, carrying Edna away to where she belongs – or a villain, blocking her escape to the place she longs to be? And what about Edna? Is she really in love? Or just in love with the idea of being in love, an image as unrealistic as her picture of what work would be like? As I said earlier, Susan Glaspell is new to me, but according to the potted biography at the back of the book, she was an American ‘born of pioneer stock’ in 1876 and died 1948. 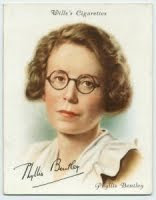 She worked as a society and political reporter, and wrote plays and novels, two of which are published by Persephone, and I would like to read them.